Riding with husky dogs through empty white snow plains is an unforgettable experience. If you feel like skipping skiing and doing something instead: a husky ride is a fantastic alternative! The dogs will surprise you with their unprecedented display of endurance. It seems like they are inexhaustible. The huskies will take you to fabulous lakes, forest and open plains. We work together with our Husky friends from Beito Husky Tours, All the trips can be booked by us. Two persons will share a dog sleigh that will be pulled by a team of 6 dogs. One will steer the husky sledge and the other can sit comfortably on a reindeer hide. Swapping over is always possible. Once the guide starts instructing you, you can start by harnessing the dogs to the sleigh and the ride can begin. Dog sledding is suitable for anyone, aged 6 and over. We can offer day and half-day packages. No experience needed! Book your tour for next winter 2015/16 now! 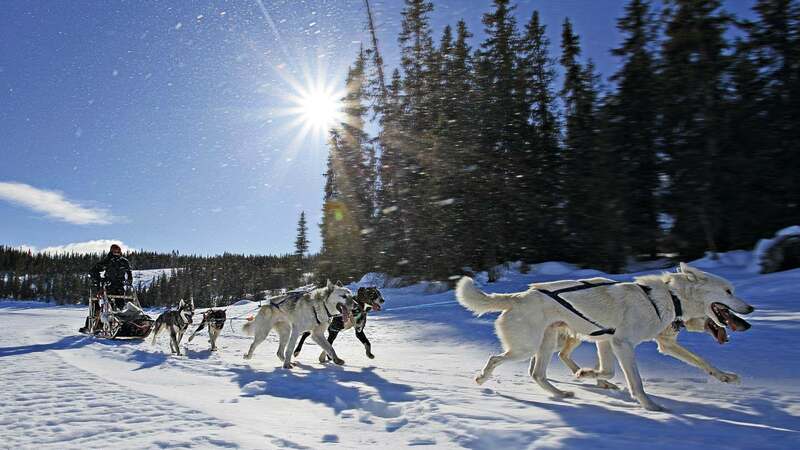 If you wish to use half a day in the snow covered mountain around Beitostølen, with a bunch of happy and hard working huskies in front of your very own sled, the Chinook Adventure Trail is perfect for you. This tour is named after one of our eldest but cutest dogs. It still leaves you time for other activities the same day. The tour is suitable for most people. Bring all your friends and family. No previous experience is needed! If you don’t want to steer your own team you can choose to join as a passenger sitting comfortably on warm reindeer skins in the sled. Visit the home of our 40 amazing husky friends. Learn how to handle and drive your own team of huskies through the 15 km wilderness trail. Coffee/tea, cookies and many stories in the warmth of the camp fire in our wooden lavvo. Hungry? prolong your husky-camp stay and taste the wonders of the Valdres kitchen. We invite you to eat local food with us. Seated arround the flames in our cozy wooden lavvo, you will be served a smoking hot wilderness stew. Served with various breads and accesories. Price 350,-/person. This «Musher for a Day» experience is named after our dog Loke, an up and coming beautiful young Husky male. During a full day you will get a special insight into the world of mushing. This tour will bring you closer to the dogs, and give you a better understanding of the art of long distance dog sledding. After meeting the dogs, we pack the equipment and prepare the teams for a full day in the wild. Depending on the weather- and snow conditions we will cover 35 to 50 km. Half way through, we settle down and set day camp with open fire and reindeer skins. While the dogs gets a snack and take a nap in the snow, the guide prepares a real wilderness lunch. Loke and the rest of our keen huskies will greet you in the dog yard. From Beitostølen Centrum, there goes a road down to Beito. You drive that road all the way, until you come to a T-cross (2,5 km). In the cross, you turn left and drive 3,5 km until you come to a sign by the road which says ”ENJOY BEITO”. There is parking place by the sign, right by the road. The guide will meet you by the sign at the agreed time. The dog yard is located further down the road towards the lake, and is not possible to see it from the road. Please, don’t try to drive the road down to the dog yard with your own car! Dog sledding is for everybody and no previous experience is required. Children can join, but if you are under 14 years of age, you will be sitting on the sledge. Children under 6 years will seat with a parent or in the guides sledge. However, we would like to talk to the parents before allowing children under 6 to join our tours. It ́s the parents responsibility to evaluate if their children under 6, should join one of our winter tours. You will have the opportunity of DRIVING YOUR OWN DOG TEAM. As well as being an active part of the whole process from harnessing the dogs, preparing your team to putting them back as we arrive home. An experienced guide will give you all the needed instructions on dog driving and will drive the first team. The rest of the teams will always follow the guide. Normally 2-3 persons will share a sledge pulled by 5-7 dogs and change between driving and sitting on comfortable reindeer skins enjoying the speed feeling from a ground level. No previous experience is needed to go dog sledding! A sense for learning new skills, adventure, normal condition and reasonable sense of balance, is all you need. It’s not really necessary to be a passionate dog-lover to gain the respect and get in touch with these hardworking animals. An experienced instructor will give you the guidance you need. Most of our guests experience that they do develop a feeling of belonging and companionship with “their” dogs. Many will come back to “mush” them again. If you have a physical or mental disability it will often still be possible to join the tours. We need to be contacted with this information beforehand, so we can evaluate how to proceed. Is your weight over 99 kg we kindly ask you to mention this when you make your booking. Let us know if you have a medical condition or any special need that we should be aware of. Food allergies are also important to report to us when you book your trip. Then, a thicker layer . Woolen sock, preferably two pairs. feet and the boot material is the key to keep your feet warm! Use quality warm and windproof hat and mittens (warmer that finger gloves). We have thermal suits and boots available if needed. These are included in the price in most tours. Contact us if you are not sure about the clothing and we will help you.